Item #N168494 - White Faux Pearl Vintage Bib Necklace. Lustrous white pearl vintage bib, three strands upper portion and four strands in front connected by a glitzy clear crystal studded bar on each side. New old stock from the 80's in mint condition. Never been worn. A fabulous necklace to wear at weddings, prom nights, pageants, parties, cruises and special functions! US$138.00. Item #N168497 - White Glass Faux Pearl Clear Crystal Ball Vintage Necklace. Silky smooth lustrous white glass faux pearls alternating the glistening clear crystal balls on a soft yet sturdy goldtone chain. So pretty and feminine! Each glass pearl measures 5/8" and the crystal ball 1/2" each! 12 prong-set faceted sparkling clear crystal stones made up each crystal ball! Total 5 sparkling crystal balls and 6 glass faux pearls. Very well-made. New old stock from the 80's in mint condition. Never been worn. A fabulous necklace to wear at weddings, prom nights, pageants, parties, cruises and special functions! US$128.00. SOLD. Item #N168502 - Signed Trifari Milk Glass Vintage Estate Antique Designer Necklace. Designer: Signed TRIFARI and a copyright symbol. 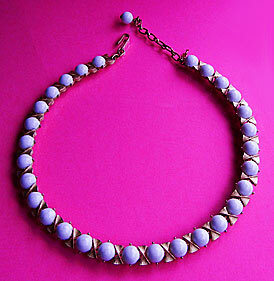 Signed Trifari milk glass vintage necklace! Lovely lustrous milk glass round beads set in between textured brush goldtone ribbons! 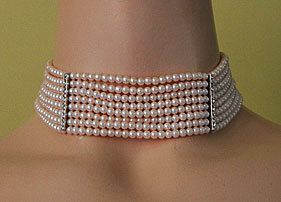 A gorgeous single strand to decorate the neck base. 'J' closure hooking to extender to close the necklace (popular in most 50's necklaces). Extender dangles a Trifari signiture key. Excellent condition. A fabulous necklace to wear at weddings, prom nights, pageants, parties, cruises and special functions! US$148.00. SOLD. Item #N168511 - Clear And Jet Glass Bead Vintage Estate Antique Torsade Necklace. Beautiful multi strands clear and jet glitzy glass seed beads done in torsade style! Wear the strands loose or twisted, either way, you'll look absolutely ravashing! Excellent condition. A fabulous necklace to wear at weddings, prom nights, pageants, parties, cruises and special functions! US$128.00. 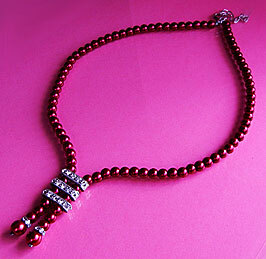 Item #N168496 - Art Deco Style Ruby Red Clear Crystal Vintage Necklace. Size: Length: 19" including the 2" extender. 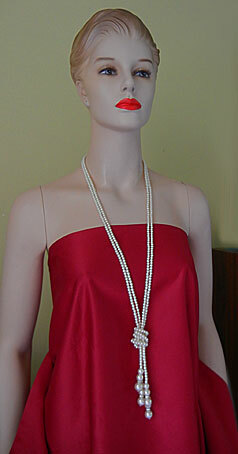 Exquisite Ruby Red lustrous faux pearls with glitzy clear crystal studded bars in the front forming a gorgeous necklace that exudes a classy Art Deco appeal! New old stock from the 80's in mint condition. Never been worn. A fabulous necklace to wear at weddings, prom nights, pageants, parties, cruises and special functions! US$138.00. 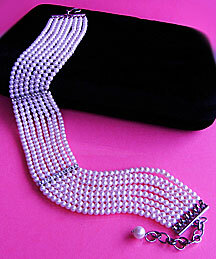 Item #N168489 - Two Strand White Glass Pearl Vintage Long Necklace With Tassel. Item #N168512 - Signed Coro Pastel Green Confetti Lucite Vintage Estate Antique Designer Necklace. Flaw:Slight goldtone plate loss on two half-moon lucite stone goldtone rims as seen on enlarged photo. Not noticeable. Designer: Signed Coro (in script and a copyright symbol). 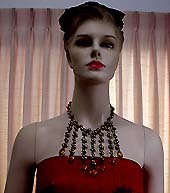 Signed Coro Designer vintage necklace! Glitzy confetti imbeded in the half-moon shaped lucite stones reflecting purple, gold and green glitters! So beautiful. Stones are mounted in a scrolly goldtone design. Each lucite stone measures 1" x 1/2". 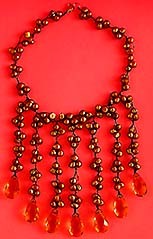 Except for slight goldtone plate loss (not noticeable), this beautiful collectible necklace is in excellent condition. A fabulous necklace to wear at weddings, prom nights, pageants, parties, cruises and special functions! US$138.00. 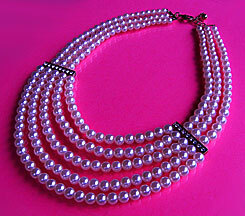 Item #N168501 - Art Deco Style White Faux Pearl Clear Crystal Vintage Collar Necklace. Size: Length: 15" including a 3 extender". Pretty white faux pearl multi strand collar necklace featuring glitzy clear crystal bars symmetrically individed into 3 sections and eccentuated a sophisticated Art Deco flair! New old stock from the 80's in mint condition. Never been worn. A fabulous necklace to wear at weddings, prom nights, pageants, parties, cruises and special functions! US$118.00. 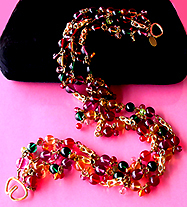 Item #N168462 - Signed Vince Agore Multi Strand Colorful Glass Bead Vintage Estate Antique Designer Necklace. Designer: Signed VINCE AGOR on hanging metal tag. 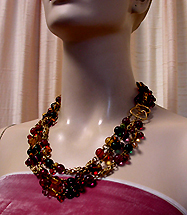 Signed Vince Agor multi strand colorful glass bead vintage designer necklace! Lush colorful glass beads, 3/8" each, smooth, reflective and linked with gleaming tool-out barrel goldtone nuggets form a spectacular decadent necklace. Also smaller colorful glass beads dangling from main beads to further create interest, beauty, style and movement! The classy large hook-clasp can be worn to the side for a different gorgeous look! Excellent condition. A fabulous necklace to wear at weddings, prom nights, pageants, parties, cruises and special functions! US$168.00. 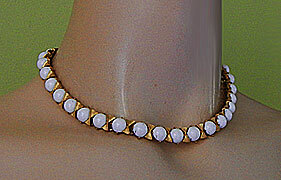 Item #N168346 - Milk Glass Clear Crystal Rhinestone Goldtone Vintage Estate Antique Necklace. 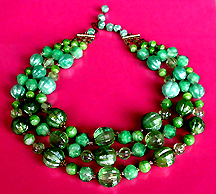 Item #N168418 - Three Strand Pastel Green Lucite Bead Vintage Estate Antique Bib Necklace. Size: Length: 18 1/2" including the 3" extender. Timeless three strand beaded vintage antique estate necklace graces the neck! Pastel Spring green lucite beads contrasting in shades and sizes, translucent and opaque, baroque, ribbed and smooth, to form an elegant, attractive, bold bib. The beads have glitzy clear glass seed bead spacers with vintage filigree gold caps accenting some large beads. The largest beads measure almost 3/4"! 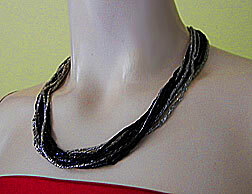 Excellent condition A fabulous necklace to wear at weddings, prom nights, pageants, parties, cruises and special functions! US$128.00. 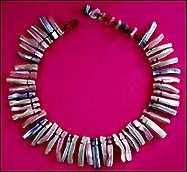 Item #N168305 - Western Germany Multi Color Pastel Genuine Mother of Pearl Vintage Antique Fringe Necklace. Size: Length: 15" including the 2 3/4" extender. Designer: Marked WESTERN GERMANY on brass hook clasp. Fantastic Western Germany vintage antique fringe necklace! Genuine Mother-of-Pearls! 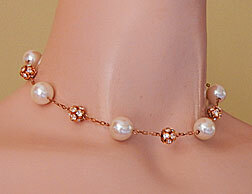 Beautiful lustrous genuine mother-of-pearls of gorgeous pastel pink, cream and blue boldly adorning the base of the neck. In between the exquisite pearl beads are glitzy gold glass bead spacers, with the genuine mother-of-pearl nugget extender to complete the design. The fringe drop is 1 1/4". Absolutely stunning! Excellent condition. A fabulous necklace to wear at weddings, prom nights, pageants, parties, cruises and special functions! US$148.00. 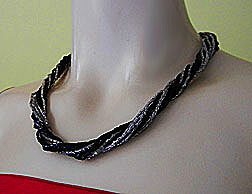 Item #N168234 - Art Deco Jet Black Onyx Fringe Necklace. The gorgeous center is strung with lustrous, smooth, long rectangular jet black onyx stones of graduated lengths. The longest piece measures 1 1/8" in length and is 1/8" thick. The end of the piece is slighty wider to give you that classy Deco look. On each side, there is a shiny golden round bead to distinquish this fabulous geometrical display. The sumptuous long rectangular pieces are smooth like marble and can be rotated so that you can have some pieces up and some down to create a different Deco design. Please see Crystal, my model, in the large photos. 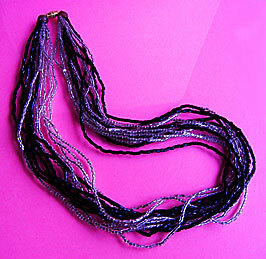 The rest of the length is strung with smooth, glossy jet black onyx round beads. This beautiful necklace closes with a golden filigree marquise shaped slide-in clasp. Very classy, elegant and Deco. Excellent condition. A fabulous necklace to wear at weddings, prom nights, pageants, parties, cruises and special functions! US$128.00. Item #N168315- White Glass Faux Pearl Vintage Estate Antique Bib Necklace. 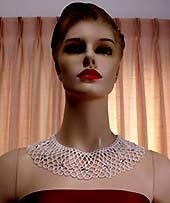 Stunning white glass lustrous faux pearl vintage wide bib necklace done in a graceful woven lacey design! 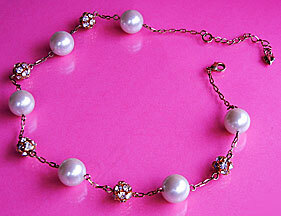 There are pearl flower motifs adorning the entire lower portion of the necklace. Each flower has a lovely pronged rose monte (antique mirror stone) center to add beauty and glitz. The beautiful bib is 2 3/4" wide. Excellent condition. A fabulous necklace to wear at weddings, prom nights, pageants, parties, cruises and special functions! US$148.00. Item #N168426 - Art Glass Bead Vintage Estate Antique Necklace. This lovely early charmer has gorgeous lustrous white art glass beads alternating the faceted plastic red beads, linked together in antique brass with a red faceted bead tipping the antique brass extender. 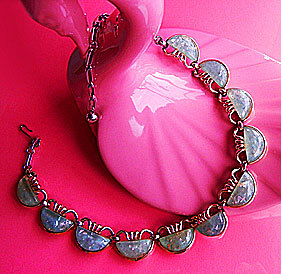 The pretty art glass beads remind me of candies good enough to eat! Excellent condition. A fabulous necklace to wear at weddings, prom nights, pageants, parties, cruises and special functions! US$148.00. Item #N168272 - Golden Natural Genuine Pearl Art Deco Design Vintage Fringe Necklace. Golden Luster! A spectacular display of lustrous golden natural genuine pearls, one pearl at a time, hand strung into an unforgettable timeless Art Deco elegance for the contemporary woman! The gorgeous drop is 5" wide and 5" in length. The exquisite glittering faceted citrine crystal teardrops are 1" x 5/8" each. This temptress genuine pearl and crystal fringe necklace pushes the envelope to a new height! Excellent condition. A fabulous necklace to wear at weddings, prom nights, pageants, parties, cruises and special functions! US$188.00.